RUGGED BOOT BUILT TO BOLDLY EXCEL ON THE APPROACH AND IN THE DRINK. 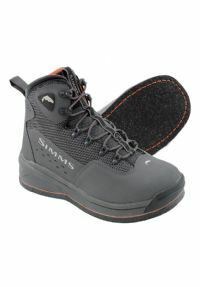 Simms' Felt Headwaters® Boot is an all-day ally powered by a lightweight, durable platform that maximizes balance and control. The scratch rubber and high-denier nylon upper ensure long life. A partial neoprene lining adds appreciated cushioning and easy on/off performance. Dual-density EVA midsoles absorb shock and bolster comfort. And die-cut, full coverage retention plates enhance rigidity.